by Bill Dwight on Friday, October 25, 2013 at 7:31 PM | LEAVE A COMMENT! 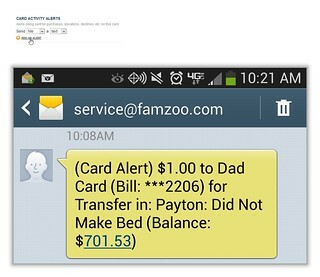 Those are all typical examples of card activity within a FamZoo family pack of prepaid cards. Good stuff to know in real-time, right? Click on the Bank tab to get to a listing of the accounts in your family. 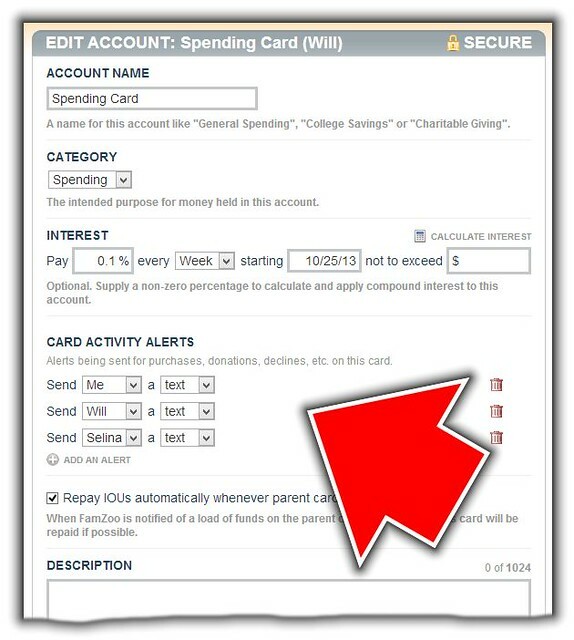 Scroll down to the Card Activity Alerts section and click on the Add An Alert link to identify the recipient and the type — either text message or email. For parent cards, you can set up alerts that notify yourself and/or any other parent in the family. The same goes for child cards, but you can set up activity alerts for the child using the card too. Now you’ll be ready to deliver that just-in-time financial education (or intervention) to your kids.